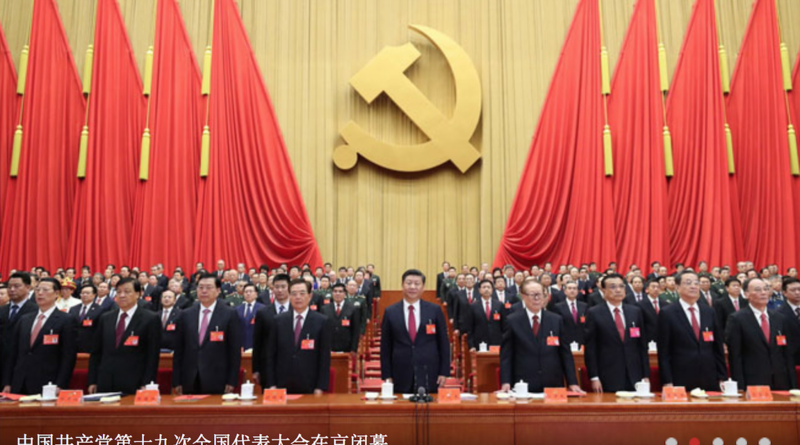 The following preliminary observations on the political report to the 19th National Congress of the Chinese Communist Party of China were offered by an expert on Chinese politics who wished not to be identified by their real name. The piece is published under the penname Wu Bing (吴冰). We offer only a partial translation of Wu’s observations here, followed by the original Chinese in full. For accuracy, we refer readers to the original — we thought it was important to get these observations out quickly, and so were translating under time constraints. My overall assessment is that the political report to the 19th Party Congress is a document bearing the clear mark and brand of Xi Jinping, and that it amounts to a declaration of Xi’s intent to hold on to power for an extended period of time. Political reports to the congresses of the Chinese Communist Party have declared congress themes clearly from the outset since the 15th National Congress was held in 1997. Statements are typically of the nature of holding high the banner of XXXX. In this respect, the author finds three things of note in this year’s report. First, the way banner terms are used continues to show differences. The reports to the 15th and 16th congresses talked about “raising high the great banner of Deng Xiaoping Theory,” and from the 17th congress in 2007 this became “raising high the great banner of socialism with Chinese characteristics.” These statements on banner terms run continuously through the 17th, 18th and 19th congresses. Second, the content of “socialism with Chinese characteristics” has been enlarged. Before the 17th congress, “socialism with Chinese characteristics” was generally prefaced with the words “build” (建设) and “initiate” (开创), and it was followed by words like “task” (事业) and “new phase” (新局面). The report to the 17th congress spoke of “opening up the road of socialism with Chinese characteristics, creating a theoretical system of socialism with Chinese characteristics” (开辟了中国特色社会主义道路，形成了中国特色社会主义理论体系), and the 18th congress report elaborated this to “system of socialism with Chinese characteristics” (中国特色社会主义制度体系). To this, the 19th congress has now added the notion of a “culture” of socialism with Chinese characteristics. So we see that the status of socialism with Chinese characteristics has been upgraded — from being the lifeline of the Party and the fate of the people, to a global movement of scientific socialism, to a matter finally of the progress of developing nations and even a solution to the problems facing humanity. I’ll make two further observations concerning the thematic language opening the report. First, we should note that the language about “the great rejuvenation of the Chinese people” appears in much more prominent position as part of the opening section propounding the theme of the congress. This phrase first appeared in the report to the 17th congress, but in the main body of the report. At the 18th congress, it appeared again, this time in a section explaining the themes of the congress. Second, we should note that the notion of the “Chinese dream” is added to the language in the 19th congress report, yielding the phrase, “tirelessly struggling to realize the Chinese dream of the great rejuvenation of the Chinese people.” In this passage, the “Chinese dream” gets its first appearance in a political report. The “Chinese dream” is one of a small number of phrases that make first appearances in this political report. Another is “not forgetting our original intentions” (不忘初心). We must remark the fact that in the 19th congress report, this language about original intentions and missions bears unmistakable hints of nationalism (民族主义色彩). The language I refer to specifically is: “The original intention and mission of the Chinese Communist Party is to seek prosperity for the Chinese people, and to seek the rejuvenation of the Chinese nation” (中国共产党人的初心和使命，就是为中国人民谋幸福，为中华民族谋复兴). These types of phrase in the political report include: “New Era” (新时代); “The Thought of New Era Socialism With Chinese Characteristics” (新时代中国特色社会主义思想); “the leadership of the Party” (党的领导); “transformation of the principal contradictions in our country” (我国主要矛盾转化) 我国国主要矛盾转化). I’ll address these one by one. On its surface, this phrasing doesn’t provide much in the way of information — so we need to look at its placement and context within the report. In my view, the raising of “new era” in the 19th congress report is to make clear that a line can be drawn distinguishing the leadership period since the 19th congress and after the 19th congress, essentially accentuating its historical status and historical purpose. Looking at theoretical formulations of the CCP in the past, we notice that the Party at its most senior levels not only interprets eras in light of domestic circumstances, but more importantly in light of the trends shaping the development of human civilization (人类文明) more broadly in the world. After the Party came to power in China in 1949, Mao Zedong held that the world was in the midst of an era of revolution and war, and the notion that “class struggle is the guiding principle” (阶级斗争为纲) wove through every aspect of the work of the Party-state. During the Cultural Revolution, we saw slogans like, “preparing for war and natural disaster” (备战备荒), and “digging the tunnels deep, keeping vast stores of grain” (深挖洞广积粮) — the entire ethos of the era being one of impending calamity for which China must be prepared. When Deng Xiaoping introduced economic reforms, the Party’s priorities were transferred to the economy, and one important precondition of this was Deng’s view that Mao had made a strategic error in judging the era. In the late 1970s, Deng Xiaoping’s judgement was that this was “an era of peace and development” (和平与发展的时代), that a third world war was unlikely, and that China must seize this historic opportunity to develop itself. From this point on, the reports at successive congresses and other major political meetings tended to emphasize that while the situation in the world was complex, we were still living through “an era of peace and development,” and the Party’s basic line must be followed. In the 19th congress report, the notion of a “new era” is based essentially on changes inside China, and doesn’t involve a reading of changes in “human civilization” or global trends. We see the idea basically that after 40 years of economic reform, China’s economy and society have made remarkable gains, and now China’s development is at a new point where it faces new contradictions, new situations and new problems. In my view, given the justifications in the report, the word “phase” might have been a more accurate characterization. But of course, talk of a “new phase” would likely have been insufficiently strong to match the idea of a new thought of socialism with Chinese characteristics. “Era” and “phase” are hugely different. Theories are derived from practice, but eras give birth to thoughts. [NOTE: talk of a “new era,” in other words, lends much more gravity to Xi Jinping’s banner term, his own refinement/enlargement of “socialism with Chinese characteristics”]. The 19th congress report offers an explanation of the “New Thought of New Era Socialism With Chinese Characteristics” (新时代中国特色社会主义新思想). The report says that the “new thought” must answer the question: “What kind of socialism with Chinese characteristics must be upheld and developed, and how can socialism with Chinese characteristics be upheld and developed?” The principal content of the “new thought” are the so-called “8 Clearlies” (8个明确), and later there is mention too of the “14 Adheres” (14个坚持). My overall sense is that this “new thought” has not reached a theoretical apex, but is mostly right now a set of thoughts and statements on the national situation, tasks, missions, objectives, steps and demands. Its main emphasis is on arranging tasks, and most of it is providing direction. It lacks analysis and exposition on larger historical principles. While it definitely has some significance in terms of guidance, I’m afraid it cannot avoid, owing to its exhausted reservoir of ideas, the familiar problems of loss of direction, wavering and vacillation. This “New Thought of New Era Socialism With Chinese Characteristics” is the soul of the 19th congress report. It is also forms the root and basis for future actions in specific areas such as the economy, politics, society and culture, ecological civilization, Hong Kong and Taiwan affairs, foreign affairs, the military and the Party. The leadership of the Party is a principle that the Chinese Communist Party cannot and will not allow to be shaken. This is a principle that has been reaffirmed at every successive party congress through history. What is quite astonishing about the report to the 19th Party Congress is that we see the return of a phrase we have not seen since the Mao era: “Party, government, military, people and education, east, west, south and north, the Party leads everything” (党政军民学，东西南北中，党是领导一切的). This amounts to the resurrection of language from the Maoist era. Deng Xiaoping was very clear from the outset of reforms that strengthening the leadership of the Party would have to first mean improving the leadership of the Party, and this idea was emphasized repeatedly. The language in the report to the 13th congress in 1987 was especially explicit about this in its content about political system reforms (政治体制改革). The report to the 16th congress too talked about reforming and improving the Party’s methods of leadership and governance. This language is not carried forward in the report to the 19th congress. If we take the language in successive Party congress reports together for comparison, we notice something quite noteworthy in the 19th congress report. While upholding and strengthening the leadership of the Party remains a fundamental and consistent position, the 19th congress report diverges from reports of recent decades on the question of why and how the Party leads — and there are indications, it seems, of a return to the Mao era. The political report to the 13th congress in 1987 offered a reaffirmation of the Party’s conclusions at the 8th congress concerning the principal contradictions of Chinese society, saying: “The chief contradiction we face at the present stage is the ever-growing material and cultural needs of the people versus backward social production.” The report to the 19th congress said: “Socialism with Chinese characteristics has entered a new era, and the principal contradiction of society in our country has been transformed into a contradiction between steady advancing lifestyles and unequal and inadequate development.” This expression has new meaning, and it provides practical space for future deepening of reforms. If this notion of principal contradictions is hardened into a formal expression, it might come to serve as an ideological guide to promote and legitimise attempts to deep reforms in different areas.